The doro wot’s thick sauce clung to simple chicken drumsticks, which tasted as rich as beef. At Anfilo’s coffee ceremony in the middle of the Grand Lake farmers market, frankincense burns a constant, clean smoke. Everyone chats idly around a low table, listening for the sharp, cracking sound of just-roasted coffee beans, and the equally sharp, short cup of espresso-like coffee that follows. In striking and beautiful contrast to the frenetic market, it’s an intimate, peaceable affair, bidding one to slow down. But that’s not easy to do at Anfilo’s brick-and-mortar café, on the busy corridor at Broadway and Grand, where people tend to rush. 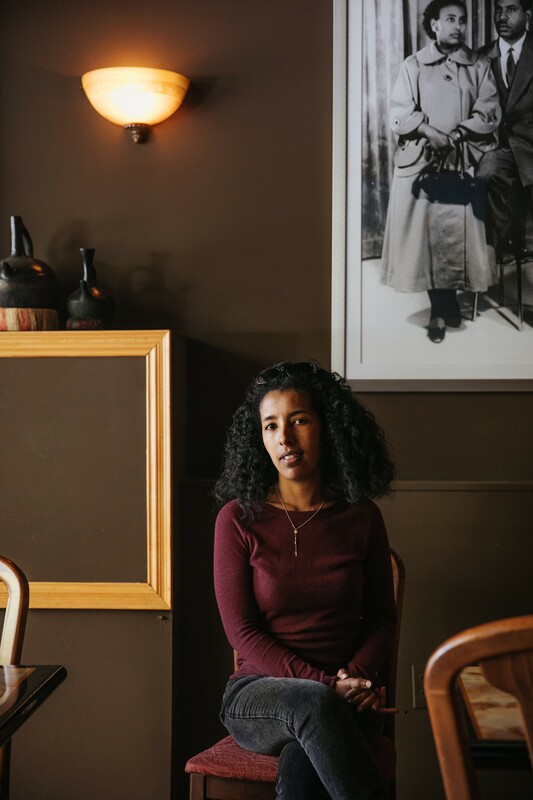 And so, the cafe shifted its business, from making the Ethiopian coffee more known to its hip, food-knowledgeable neighborhood, to creating a more modern context for the rich tradition of its food. Manager Ambessaw Assegued and his wife, Dagmawit Tesfaye, who owns the business, have been here a long time — Assegued for more than 35 years — and the restaurant seems fully aware of the expectations of the local foodies. Hanging on its walls are pictures of Ethiopian socialites, not Ethiopian basketry, and playing on the stereo is vintage Afrobeat and modern Ethiopian music. 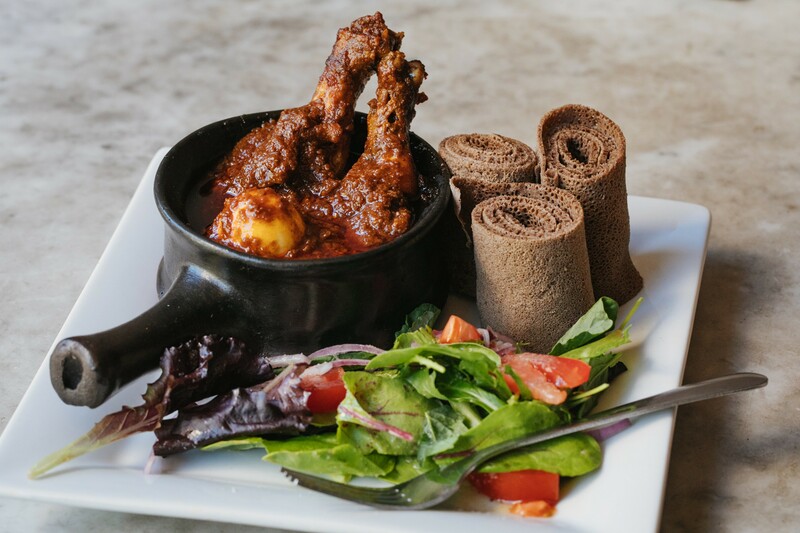 The place provides forks, and serves its a la carte meat dishes on plates with injera on the side, making for cleaner flavors. Most importantly, Anfilo makes a point to source fresh, vibrant spices. It shouldn’t be any surprise that an outfit that imports hand-picked coffee growing wild in the forests of Ethiopia might take similar care with its spices. Anfilo gets theirs in Ethiopia, from Tesfaye and Assegued’s family. As opposed to Ethiopian commercial spice companies, which machine-dry and process their berbere and shiro spice mixes, the family dries its chilies and other spices in the sun and does everything by hand. Also handmade is Anfilo’s spiced ghee. It’s a difference I could taste. I found many of Anfilo’s dishes spoke louder, in fiery and flowery tongues, than the more popular Injera in Alameda and Café Colucci in Oakland. The spices are more dynamic; the chilies have a slightly more forceful sting. After my first breakfast there of strong coffee — made traditionally, but in the kitchen — and banatu firfir, injera tossed in berbere, I felt like my neural circuitry fried and my body fell into an altered, euphoric state. I found that each dish in Anfilo’s lunch buffet stood out boldly against the others. The kik alicha, a yellow split pea stew spiked with ginger and garlic, was the sweetest, its child-friendly mildness as far away as one can get in character from the spicy, berbere-spiked savor of Anfilo’s mesir wot of red lentils. It was a force to be reckoned with, and on my first visit, I found it addictive. Berbere continued to dance on my tongue in the doro wot, or chicken stew. Wots are generally thickened with onions that have been cooked until falling apart; in this case, the thick sauce clung to the meat, making a simple chicken drumstick taste as dark and rich as beef. What balanced the meal was the strong, earthy tang of Anfilo’s injera, made with 100 percent teff. It was darker, less fluffy, and sourer than most, and I found that it stood up nicely to Anfilo’s bold spicing. Should one want a more temperate meal, there are a good number of milder dishes. I reveled in the flavor of ghee in the cafe’s breakfast of quinch’e, a comforting dish of cracked wheat, cooked al dente. The ghee, sweet and flowery, allowed each grain to separate and roll on the tongue, and was all that was required to elevate a simple bowl. Anfilo does have misses. I found the eggs in its Asmara scramble of onions and beef to be a bit overcooked, its curds too dry. Its gomen, a dish of braised kale, was chewier than I would have liked. And the spicing does vary in small degrees from day to day. On most of my visits, the heat was fairly brazen. But on my last, it seemed a little more moderate. Though Ethiopian coffee takes time, the buffet is perfect for those who lack it. It’s an efficient spot for a good $10 lunch for local worker bees — you can just go up to the counter, grab a takeout container, serve yourself, and be on your way. You’ll find in great part the typical lentil or chickpea dishes one sees in the veggie combos around town, and, generally, at least one lesser-known item, like green beans sautéed in onion, tomato, and pepper. Other Ethiopian restaurants in the area may do better business, but I like going here, where there’s always a kind word from the staff and something new to explore. Anfilo’s menu changes all the time — on my last visit, kitfo, the raw dish of beef mixed with ghee and served with mitmita, had just appeared on the menu, as had a breakfast foul or phool, both of which, I trust, would be worth my time.